Takanini Community Church’s identity statement is one of the best that I have ever read. When I was thinking about what the Lord wanted me to share as Penny and I resume our roles here, one of the thoughts I had was to examine some texts that might serve as the scriptural basis for that statement. Last time, we looked at Ephesians 2, and looked at what it meant for the Ephesians believers and other Christians in Paul’s time to live as a family. Today’s text serves as a good scriptural basis for the idea of the local church being made up of believers in Jesus Christ. The apostle Peter lived through one of the most difficult and challenging times for the early church – a time when both the Jewish establishment in Palestine and the Roman authorities throughout the Gentile world were turning against Christians, treating them with discrimination and violence, and persecuting them for their faith. 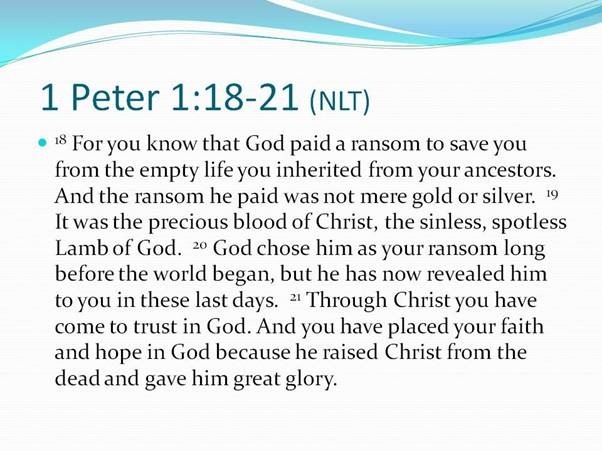 The reason I mention this is that nowadays when some people talk about faith they are referring to something entirely different than what Peter was talking about in this passage. I have heard people describe faith as if it is some magical power that Christians get that they can use to make themselves healthier, wealthier and more intelligent. Some people think of faith as a kind of spiritual strength that can help them get promoted at their workplace, make a million dollars, or raise super-spiritual children without any effort. · “There is wonderful joy ahead, even though you have to endure many trials for a little while” (1:6). · “These trials will show that your faith is genuine. It is being tested as fire tests and purifies gold– though your faith is far more precious than mere gold. So when your faith remains strong through many trials, it will bring you much praise and glory and honour on the day when Jesus Christ is revealed to the whole world” (1:7). · “even if you suffer for doing what is right, God will reward you for it. So don’t worry or be afraid of their threats” (3:14). · “Remember, it is better to suffer for doing good, if that is what God wants, than to suffer for doing wrong!” (3:17). · “Dear friends, don’t be surprised at the fiery trials you are going through, as if something strange were happening to you. Instead, be very glad– for these trials make you partners with Christ in his suffering, so that you will have the wonderful joy of seeing his glory when it is revealed to all the world” (4:12-13). · “So if you are suffering in a manner that pleases God, keep on doing what is right, and trust your lives to the God who created you, for he will never fail you” (4:19). My point in bringing this up is that there are all kind of “believers” in this world, and all kinds of “faith.” So, when we say – as a church – that we are a family of believers in Christ, I want to make it absolutely clear what we are not saying. We are not saying that we have found the super-drug that is going to make us impervious to the problems and trials that normal people face in this life. If you’ve found that kind of faith, I’m glad for you, but I haven’t, and neither did Peter. He lived in a real world, where God’s love for him did not mean that he was going to live above its problems. In fact, Peter – and all the other apostles except for John – were executed for their faith. But their faith was real, and I believe it was that real faith that Peter was talking about. It is quite possible that some of the people in this generation who call themselves Christians have never been introduced to that real faith. Today’s text gives the basic defining elements of it. Let’s review them, shall we? As odd as it may seem, true biblical faith does not begin with the act of believing. It begins with the object of that belief. You can have the strongest faith in the world, but if you put that faith in a rock or a piece of wood, your faith is useless. That’s why Peter begins his faith talk not by asking his readers to look deep inside, but asking them to look up. Faith works only if there is a powerful object of that faith. The church’s faith-object is its founder: almighty God, who set the processes of our eternal redemption and restoration in place. He did this by choosing his own Son, and sending him to die in our place, as the ransom to buy us back from the consequences of our sin. 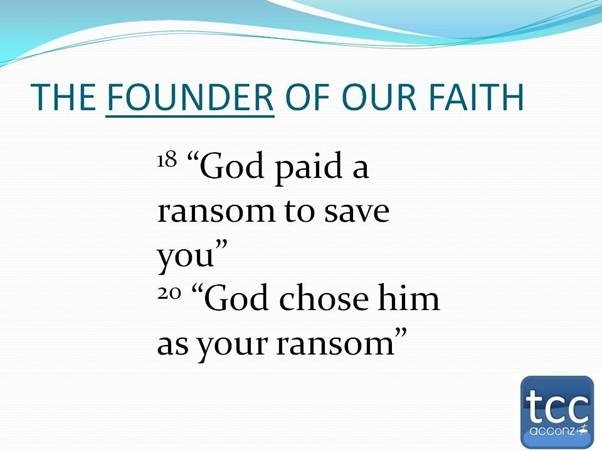 Biblical faith begins with God. The second basic element of biblical faith is also not something that we do, but something that was done for us. Christ’s death on the cross was absolutely essential. We could have had all the faith anyone has ever seen, and it would have been useless to save us. Sin had separated us from God’s favour and condemned us to experience his enmity and wrath. So, God in his love paid the sacrificial price for us. Jesus himself is described here as “the sinless, spotless lamb of God.” Suddenly, all those sacrifices under the old covenant make sense. They make sense not because God could ever really be appeased by an animal sacrifice. They make sense because they were pointing forward to the day when God himself would provide the sacrifice to bring atonement. The focus of the Christian faith is Jesus Christ, and he is enough. You haven’t even begun to express that faith if you are still expecting God to do something else for you before you will really commit to him. Satan knows how to push your buttons, and he will keep pushing you as long as he thinks it is working. If you get into despair every time the road gets bumpy, he will keep you travelling on a bumpy road the rest of your life. His goal is to get you to give up. But what happens when you are travelling that bumpy road, and you look to Jesus? He travelled it first, didn’t he? He came to this planet for the very purpose of suffering, being defeated and killed – for you. He is the focus of your faith, not your faith. So, it really does not matter how much faith you have. All you need is a little tiny bit of faith – a mustard seed’s worth, because it’s not the quantity of your faith that matters. It’s the sufficiency of the focus of your faith: Jesus Christ. Your weak, small, tiny, diminutive, teensy-weensy faith is enough to save you for eternity if it is focused on the amazing, miraculous grace of God and the atoning sacrifice of Christ on the cross. · “But even if you suffer for doing what is right, God will reward you for it. So don’t worry or be afraid of their threats. Instead, you must worship Christ as Lord of your life. And if someone asks about your Christian hope, always be ready to explain it” (3:14-15). 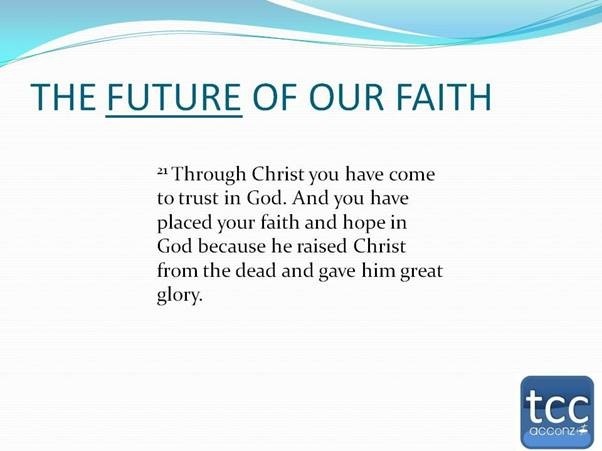 · “you have placed your faith and hope in God because he raised Christ from the dead” (1:21). The hope that Peter steered his readers to was not a hope of something happening at death. It was a hope of a resurrection. Just as God raised Jesus Christ from the dead, so he will raise us when Jesus returns. Peter told his readers that they can stand firm in their faith because the same God who raised Christ and glorified him also intends to do the same for us. So, even if we do suffer during this life, our destiny is sure. The fact that Jesus suffered and then was raised and glorified is all the proof we need. And, the little faith that we have is all the faith that we need, because it is faith in the God who raises the dead. You are invited to join this family of believers seeking to follow Jesus Christ and live out his teaching while we watch for his return. Put your faith in God, focus your faith on Christ’s atoning sacrifice, and trust God to resurrect you and glorify you at his return! 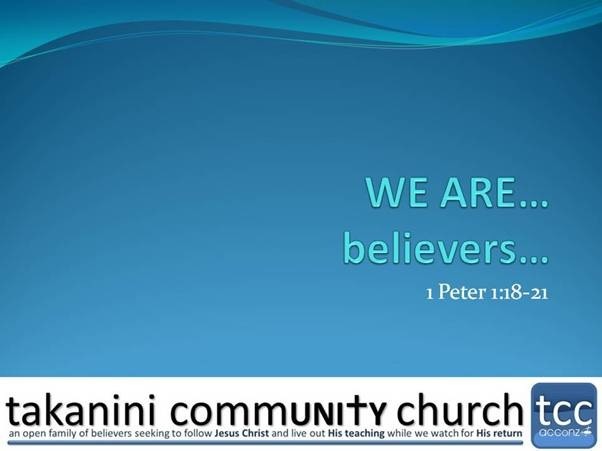 This entry was posted in sermon, sermon-archive and tagged Takanini Community Church. Bookmark the permalink.